Using Blender Cycles, you can create some awesome looking lighting for your scenes. Especially with Cycles, you can light up your scenes quite professionally with a simple setup in minutes. A few years ago, back in the days of Blender Internal, you would have to spend some times to build a complicated looking lighting setup to light up something as simple as a room. Nowadays, it’s a lot simpler and if you’re a beginner, you will find lighting your scenes in Blender to be quite intuitive. In this beginner, Blender lighting tutorial, you will learn about using Blender’s lights in no time! But first, we must know about the different types of lights you have at your disposal. 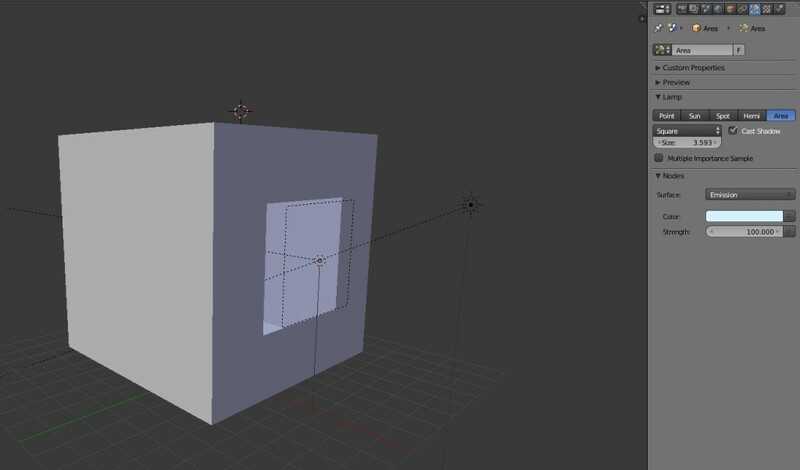 In your 3D viewport, you can add lights in a similar way to adding meshes. That is, by pressing Shift+A -> Lamp. Point: This light shines from the point source in all directions. The light travels some distance before it dies off. This light would be ideal for desk lamps, ceiling lights, or any other item where there is a definite light source. Sun: This light shines with uniform strength everywhere. It never dies off no matter how further away it is from your scene. Thus, changing the location of the sun lamp does nothing. Rotating the sun lamp however, would change the direction of the sun light. This is obviously a great lamp to simulate the sunlight of a bright sunny day or a nice evening. Spot: Behaves like a spot light. You rotate the light in the direction where you want to cast the spot light. Currently, with Cycles, you won’t see the halo effect god ray thingy when you shine your spot light on something. You would have to set up volumetrics to make the god rays appear. Hemi: Shines light 180 degrees and, like the sunlight, can be positioned anywhere without changing the lighting and can be rotated to change the direction. This light is great for fill lights or to simulate light from the blue sky. Area: Area lights also cast light from a point (like a Point lamp) except the light source is larger and in the shape of a square/rectangle. Because of the larger size, these lights tend to give softer shadows. Great for studio photography type shots and shopping mall lights! 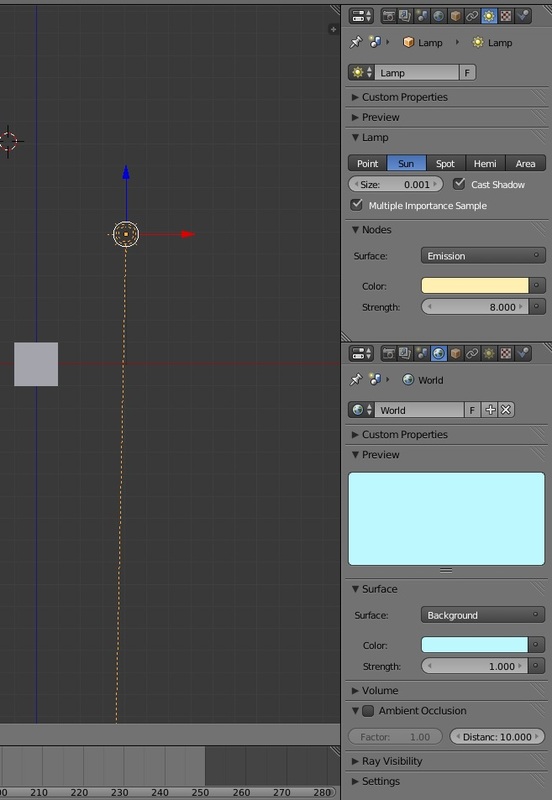 Emission mesh: Although not an actual lamp in Blender, Cycles has a material shader type called “Emission”. This means your meshes can also emit light! Pretty cool! Obviously, you could do tons of stuff with this, like make some fireworks or create a god-like character which emits light, or campfires or even create that glowy fish from Finding Nemo. A little note about lights: If you want to do stuff with lights such as change color or strength, you need to select your lamp and then go to the Object Data tab in the Property panel. There are images below of me changing color and strength of the lamps. You might see a thing you can change called ‘size’. This means how large your light is. Large sizes means your light is larger and thus gives you softer shadows. Smaller sizes means your light source is tiny and will thus give you sharper shadows. Although this isn’t really Blender-related, here are some basic and decent lighting setups you can use in your scenes to make your scene awesome times better. 3-point lighting setup: This lighting setup is mainly for studio photography type shots. To simulate this, you need 3 lamps. They can all be either Area lamps or plane meshes with Emission shaders as materials. The 3 lamps are called Key Light, Fill Light and Back Light. The Key Light is pretty much the main light that shines on your subject. The Fill Light compliments the Key Light and shines from a side angle. The Back Light shines from the back of the subject to give it that nice silhouette look. Explaining this in detail would be a tutorial on its own. Click here to learn from the masters! Daytime Light setup: This is a simple setup but might not be obvious to the newbie. To simulate daytime, all you need is a sun lamp with high strength (say 8 with size 0.001) and a hemi lamp with low strength (say 1). The sun lamp should be a yellowy color and the hemi lamp should be a light blue color. If you want an evening sunlight, change the sun color to orange and use a larger size like 0.008 or something. This will give you those softer shadows you see in evening sunlight. Nowadays though, the trend seems to be HDR lighting. Again a tutorial on its own, but you would load a sky HDR image in the World properties panel and set the strength to however much you feel is required. This is shown below but I don’t use a HDR image, I just use a plain blue sky color. NOTE: HDR images use a lot of memory so be sure to use it only if you want epic photorealism. Indoor Light setup: This is one of the more difficult light setups to get right in Cycles. It seems no matter what I do, I always get TONS of noise from interior rendering in Cycles. Anyway, a typical light setup would involve a sun lamp angled to shine through a window, and area lamps that fit the size of the window. The Sun Lamp would have a yellowy color and a high strength (say 8 with size 0.001) and Area Lamps with low strength with blue-ish color, like the sky. I hope this beginner Blender lighting tutorial has been useful to you. Feel free to go ahead and light your scenes!